Valerie grew up in Montana on the Flathead Indian Reservation. Montana's unemployment rate — 4 percent — is one of the lowest in the nation, but joblessness remains a persistent problem across tribal communities with three or four times more people out of work than elsewhere. Poverty sparks drug use, breakdown of the family and school dropouts. 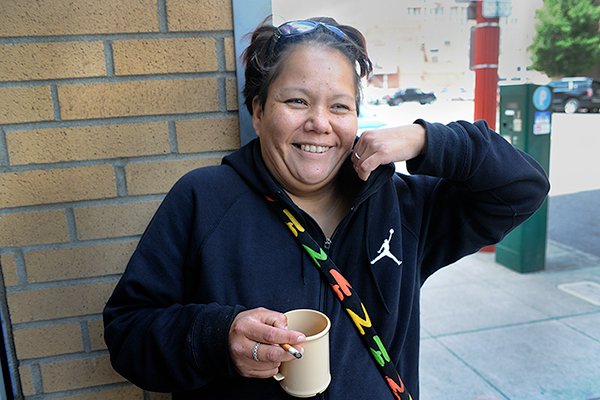 From that environment, Valerie moved to Portland to seek a better life. Things did not work out as planned. Almost immediately, she discovered that housing prices were too high for her. She had never been homeless before. In desperation and tears, she called her mother to ask for help. Financially, her mother could do nothing, but suggested she call the Portland Police in hopes that they could find her safe shelter. Valerie called the police, but their response was to drive her to the Greyhound bus station and offer to purchase her a ticket home. Not wanting to return to life on the reservation, Valerie decided to stick it out. Acquaintances suggested that she try to qualify for disability payments. “I am not disabled in any way,” Valerie declared. Then she was approached by a woman who claimed to be running small shelters for homeless women. “Something didn’t feel right”, says Valerie, who declined. Soon after, she learned from street talk that her fears were well founded because sometimes the offers for shelter lead to human trafficking. “Women on the street can easily be victimized and fall prey to those with bad intentions,” she says. Valerie has found a place to live and is off the streets now. Blanchet House of Hospitality in Northwest Portland has been key to her plan. With the precision and speed of an assembly line, diners at the Blanchet House in Portland’s Old Town receive lunch. In less than an hour on this day, 552 hungry people, including Valerie, enjoy a warm and nourishing meal. Jay, floor manager for the dining room (known as Founders’ Café), runs a tight ship. Jay is a graduate of the Blanchet House residential program for men struggling with addictions, mental health diagnoses and unemployment. Before entering the program, he managed food carts in downtown Portland. The city purchased the food cart property for a housing development, which to this day has not materialized. Jay no longer had an income. The rent at his home was $1,600 per month, and he could no longer afford it. “Fortunately, I never hit the streets,” says Jay. He was familiar with the transitional shelter program at Blanchet House. 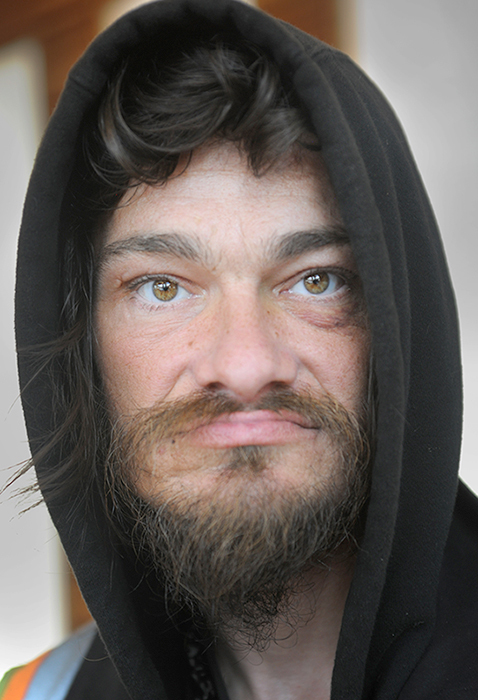 He had abused alcohol, was unemployed, broke and soon to be homeless. He applied to Blanchet and was accepted. 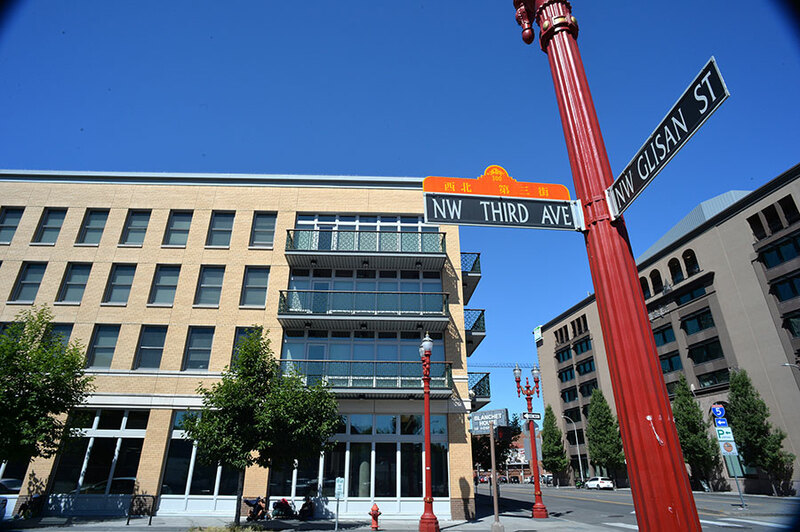 Julie Showers, marketing and communications manager for Blanchet House, estimates that half the people served are not homeless, but live in subsidized housing and are on fixed incomes. Blanchet House is Catholic by tradition, but receives no funding from the Archdiocese of Portland or parishes. However, the majority of support comes from individuals within the Catholic community. For a half hour, café patrons have been lining up outside Blanchet House, a sturdy modern building built in 2012. Like a captain at the helm, Jay assumes his position at the entrance to the café. It is now 11:30 a.m. and the lunch crowd begins to enter. Jay directs each diner to a color-coded and numbered table. “Blue one, red two,” he says with authority, as he directs the individuals to their tables and provides eating utensils. Today, volunteer students from Portland Plunge serve tuna noodle casserole, taco chips and green salad. Other students diligently clear tables to make room for the next guests. The café can seat approximately 60 people at a time, and the patrons are aware of this. They know the drill; be seated, eat and move on. That frees a chair at a table for the next guest. There are many smiles and light conversations at the tables. One young woman has brought her own Tabasco sauce. Clean up on red one and I need more forks, NOW,” Jay asserts. Lunch comes to an end, and every facet of the noontime meal has gone like clockwork. Jaden Fulsher is a volunteer with Portland Plunge, which brings students into the life of the streets during the summer. 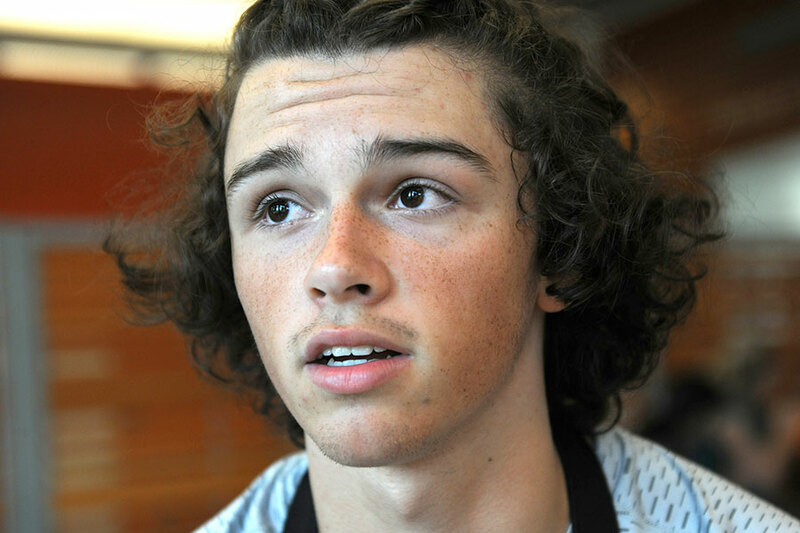 Fulsher, a student at Central Catholic, is concerned about the homeless crisis in his city. “Driving down the streets of Portland, I see so many homeless people,” Fulsher says. “I felt I really needed to get a better understanding of the homeless situation.” He feels he has a little more insight after becoming involved with Portland Plunge. Fulsher is concerned that society has made the homeless invisible. “What we really need are more treatment programs and most of all, affordable housing,” he says. Tim and Luca are regulars at Founder’s Café. Their faces reflect sadness and despair. Tim, originally from Indiana, has worked construction most of his life. 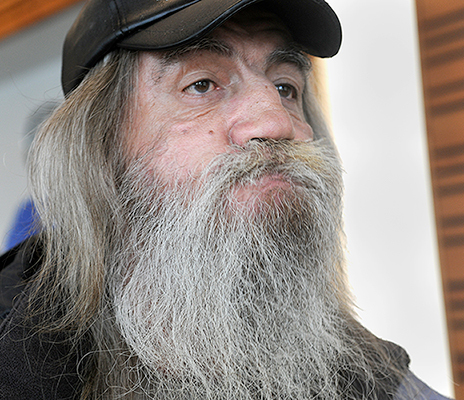 He lives in subsidized housing and receives Social Security benefits, his only source of income. The money barely covers his rent, leaving almost nothing for food. Tim depends on the café for sustainability and is grateful. He declined to say why he had left the construction trade. Luca, 40, has bright, piercing eyes. He has been on and off the streets since he was 6. “I was shuffled from one foster home to the next and then it was off to group homes, until I split for the streets,” he says. Luca, who receives Social Security benefits, also is grateful for the hospitality of the Blanchet House and Founder’s Café. Every two years, Multnomah County counts people living on the streets on one night. The 2017 count, made on Feb. 22, found 4,177 homeless people. The count includes those living on the streets, those living in emergency shelters and those living in transitional housing. Greg Baker, Blanchet House executive director, believes the number of homeless is larger than the point-in-time survey shows. “Our next wave is the aged, which could add 7,700 more to the homeless population,” says Baker. “This is an approximation of the number of homeless seniors who will be part of the 40 million who will retire over the next 24 months. This group from the Portland community will lose homes, shelter and living quarters. They will need tremendous assistance. Are we prepared for this? Should we get ready and develop the plan to avoid a major crisis?” Baker says. Baker suggests that leaders speak to people who are homeless to determine the wants and needs. 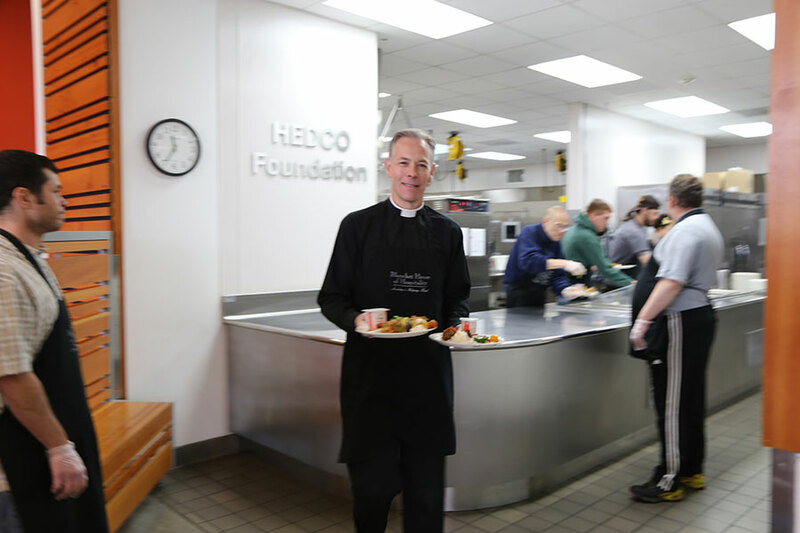 Dennis Arnold, building and food services manager for Blanchet House, began working at the house five years ago after completing the men’s residential program in 2012. 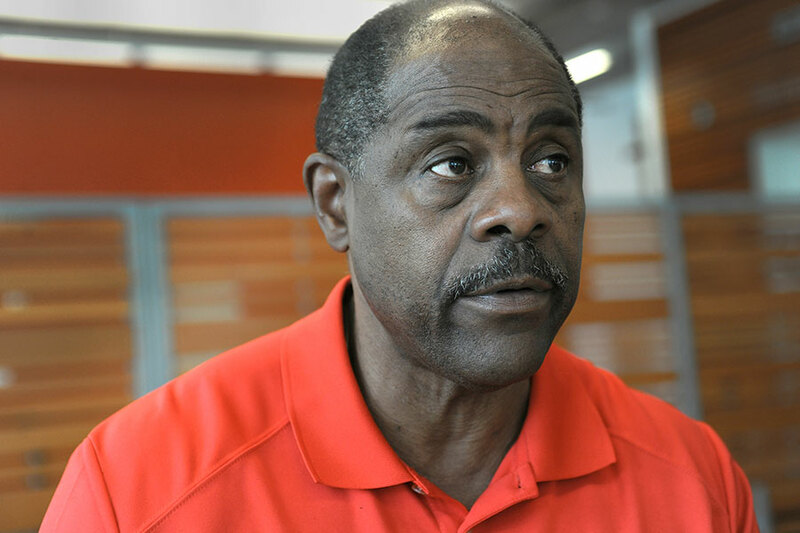 Arnold believes that the primary causes of homelessness are addiction, mental health problems and lack of affordable housing. Today’s Blanchet House was founded in 1952 by eight University of Portland students under the direction of Father Francis Kennard. The roots of the house go back to 1938 when a group of students from Columbia Prep High School organized a social and service club named after the first Archbishop of Oregon, Francis Blanchet. The students patterned themselves after the teachings of the Catholic Worker Movement, providing food, clothing and dignity to those in need. 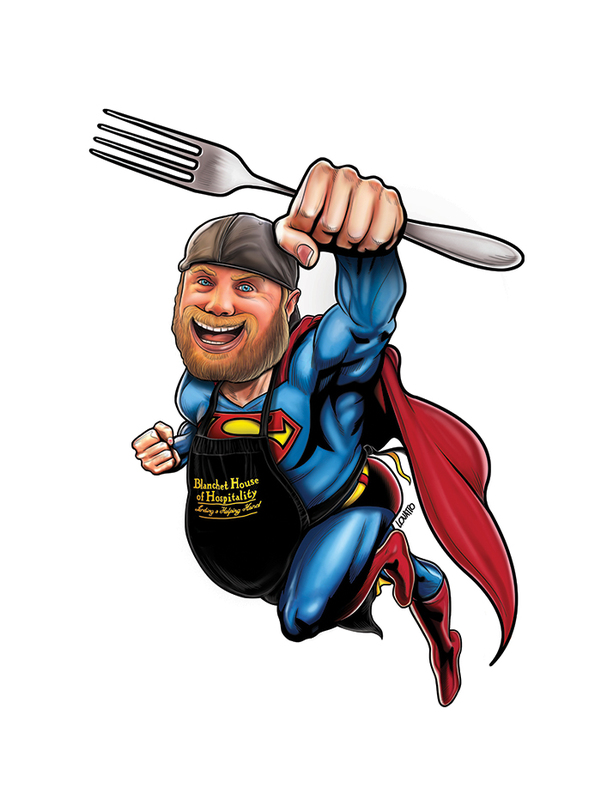 Founders Café serves 1,000 meals per day, breakfast and lunch. Last year, 350,000 meals were served. There is no food waste. Everything goes to Blanchet Farm near Carlton to feed the pigs. In addition to Founders Café, Blanchet House runs two men’s residential programs at the downtown location and at their farm in Carlton. There are 55 men in transitional housing at the Old Town site and 22 living on the farm. Both programs have men at work and participants must be clean and sober to be accepted.